One of the most beautiful, and historically significant cities anywhere on this planet. 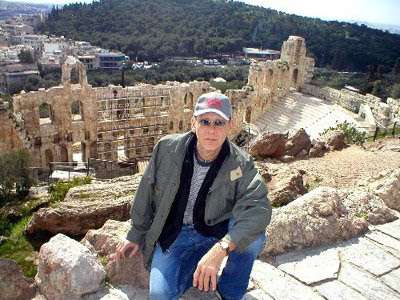 The feeling of art, and science and philosophy just permeates the air at the theater at the Acropolis. I jumped the fence and went to the stage before security caught me. I played the dumb American role and they just yelled at me. Imagine, Aristotle, Socrates, Plato, Pythagoras lecturing on philosophies and science and matematics so long ago. They were light years ahead of their time. The Parthenon is fabulous. It was built to honor the goddess of wisdom, Athena. I bought a medal and chain of Athena &amp; wore it proudly the rest of the tour. Athens is huge and from the top of the mountain you can see the city proper extend for over 10 miles standing at the top of the hill. Wayne, Gilbey &amp; myself had a awesome personal guide for the tour. You really feel like a world traveler when you are there. Just way too cool. If you can get there do it! You will love it, I swear on a stack of those scholars books!